Hristo Stoichkov (Bulgarian: Христо Стоичков, pronounced [ˈxristo stoˈitʃkof]; born 8 February 1966) is a Bulgarian former footballer who is currently a football commentator for Univision Deportes. A prolific forward, he is regarded as one of the best players of his generation and is widely considered the greatest Bulgarian footballer of all time. He was runner-up for the FIFA World Player of the Year award in 1992 and 1994, and received the Ballon d'Or in 1994. In 2004, Stoichkov was named by Pelé in the FIFA 100 list of the world's greatest living players. At club level, Stoichkov spent six years at CSKA Sofia and became the top goalscorer in Europe in 1990, receiving the European Golden Shoe. In 1990, he joined Barcelona where he earned the Spanish nickname "El Pistolero" ("The Gunslinger"), and was part of Johan Cruyff's "Dream Team" that won four consecutive La Liga titles and one UEFA Champions League. During his time at the club, he formed a lethal strike partnership with Romário. Cruyff was largely instrumental in bringing him to Barcelona where he quickly developed into one of the most prolific forwards in the world. Stoichkov was a member of the Bulgaria national team that finished fourth at the 1994 FIFA World Cup, of which he was the top scorer with six goals and received the World Cup Golden Shoe. He was ranked the third best player at the World Cup, after Romário and Roberto Baggio, and received the World Cup Bronze Ball. Apart from his footballing talent, he was notable for his on-pitch temper. In his playing career he was also nicknamed The Dagger (Камата). Stoichkov was born in the city of Plovdiv. Stoichkov began his football career playing for hometown club Maritsa Plovdiv at age 11. In 1982, he moved to Hebros Harmanli, scoring 14 goals in the third level of Bulgarian football. In early 1985, Stoichkov joined CSKA Sofia. At the beginning of his five-year stay at CSKA, Stoichkov (who later became famous for his short temper) became involved in a fight during the 1985 Bulgarian Cup Final, which resulted in an original lifelong ban, later reduced to a year suspension. He made his comeback for CSKA on 30 April 1986, in a 3–1 away win over Sliven in a game of the Cup of the Soviet Army. On 21 May, Stoichkov opened the scoring in the final of tournament against Lokomotiv Sofia, which CSKA won 2–0. He continued his progress during 1986–87, becoming a regular in the left side of CSKA's attack. Stoichkov collected his first A Group title winner's medal at the end of the season. He scored 6 league goals that season. Stoichkov managed to win the European Golden Boot with CSKA by scoring 38 goals in 30 matches during the 1989–90 A Group season. After five years with CSKA, Stoichkov transferred to Barcelona. In his first season with the club, Stoichkov was suspended for two months for stomping on a referee's foot, but he still scored 14 league goals and 6 more in the European Cup Winners' Cup. He became part of manager Johan Cruyff's "Dream Team" and helped Barcelona to one of the most successful eras of the club, winning La Liga four years in a row between 1991 and 1994 and the European Cup after defeating Sampdoria in 1992. During his stay in Barcelona, he became an idol for the club's fans, and played in tandem with Romário in attack. Stoichkov was also known for making sure Romario attended training sessions on time, as the latter often indulged in late-night fiestas. Stoichkov was twice named runner up for the FIFA World Player of the Year, in 1992 and 1994, and he won the 1994 Ballon d'Or after leading his national team to the 1994 World Cup semi-finals. Stoichkov then had a short spell in Italy with Parma, and after a short return to FC Barcelona, he later played for Saudi Arabian club Al-Nassr, and subsequently in Japan with Kashiwa Reysol, before finishing his career in the United States with the Chicago Fire and D.C. United. Stoichkov debuted for the Bulgaria national team in a UEFA Euro 1988 qualifying match against Belgium on 23 September 1987. He scored his first international goal in his fourth appearance, a 3–2 friendly defeat of Qatar in Doha. During qualification for the 1994 FIFA World Cup, Stoichkov scored five goals to help Bulgaria qualify for its first major tournament since the 1986 World Cup. 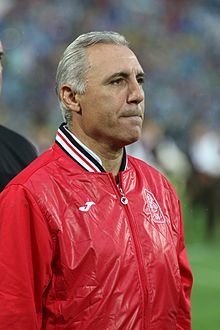 At the tournament finals, Stoichkov was awarded the World Cup Golden Boot as the joint top goal scorer of the tournament (with Oleg Salenko), with six goals, as well as earning the Bronze Ball award. He led Bulgaria past Germany in the quarter-finals 2–1, a shock result as Germany were the then-defending champions. In the semi-finals, Bulgaria lost 2–1 to Italy. They subsequently lost the third place play-off to Sweden, 4–0. Bulgaria finished second in the qualifying group for Euro 1996 behind Germany. Stoichkov scored ten goals for his team during the qualifiers, as Bulgaria qualified as one of the best six runners-up. In the first match against Germany in Sofia, Bulgaria were 2–0 down at half-time. Stoichkov equalized with two goals from penalties and Emil Kostadinov also scored for a 3–2 win. Bulgaria lost the second match in Germany 3–1. During the finals, Bulgaria lost 3–1 in the decisive group match against a strong France side; in the other match, Spain won 2–1 against Romania and so the Bulgarians went out. In that tournament, Stoichkov scored three goals in three matches. He was also part of the squad that was eliminated in the first round of the 1998 World Cup. Bulgaria was not nearly as strong as in previous years, earning only one point in a 0–0 draw against Paraguay and scoring only one goal through Kostadinov in a 6–1 defeat by Spain. Stoichkov retired from internationals in 1999 with 37 goals in 83 appearances. His last game was during the EURO 2000 Qualification against England which ended 1-1 and Stoichkov assisted Georgi Markov for the equalizer goal from freekick goal. In the same game he was substituted with Martin Petrov for whom it was debut with Bulgarian shirt. Bulgaria failed to Qualify for the EURO 2000 in Belgium and the Netherlands after the game, as they needed a win to have chanches to Qualify. He later served as coach of the Bulgaria national team from 2004 to April 2007. "That season [1993–94] Romário and Stoichkov were a force of nature, blowing everyone and everything to bits." — Football writer Sid Lowe on the strike partnership at Barcelona. Stoichkov was a quick, creative, tenacious and prolific left-footed forward who was primarily deployed as a striker, but was also capable of playing in a creative role, as an attacking midfielder, due to his ability to provide assists for teammates. He was also deployed as a supporting striker throughout his career, forming a lethal strike partnership with Romário at Barcelona, and occasionally he played as a right winger during his time at the club, although he was also capable of playing on the left or through the middle. In his early years he also used to play as a left full-back. A powerful, physically strong and technically gifted player, Stoichkov was known for his explosive acceleration, and his dribbling ability at speed, as well as for his tendency to take unpredictable, powerful shots on goal. The top goalscorer at the 1994 World Cup, he was also notable at taking free-kicks and penalties, as well as being a very good crosser and passer of the ball. Despite his talent, Stoichkov was criticised for his work-rate at times, and he also gained infamy because of his aggressive temper on the pitch; he could often be seen arguing with the referee, or with his opponents. In 2006, he was sued by a former American University college student whose leg he broke with a violent tackle while playing in a friendly match for D.C. United in 2003. The case was settled out of court in 2007 for undisclosed financial terms. The student's coach called Stoichkov's challenge "criminal". Ray Hudson, who coached D.C. United for whom Stoichkov played at the time, called it a "rash tackle". Following an investigation by Major League Soccer (MLS), Stoichkov was suspended two games and fined US$2,000. Stoichkov features in EA Sports' FIFA video game series; he was included in the FIFA 15 Ultimate Team Legends. In 2018 he published his authorized biography "Hristo Stoichkov. The Story". In the 2003–04 season, Stoichkov started a managing career, serving as a forwards coach at Barcelona. After Bulgarian national team manager Plamen Markov resigned in the wake of the team's first-round exit from Euro 2004, the Bulgarian Football Union named him as the new national team manager on 15 July. Stoichkov's managing career got off to a poor start with him failing to lead Bulgaria to qualification for the 2006 World Cup. He brought his bad temper from his career as a player to the bench. A couple of proven players quit the team due to personal differences with Stoichkov. The most notable scandal was on 5 September 2005, in a game against Sweden, where he was sent-off for insulting the referee. The biggest blow to Stoichkov as a manager of the national team of Bulgaria came on 12 October 2006, when Stiliyan Petrov, the captain of the team, announced he would not play for Bulgaria so long as Stoichkov was manager. Petrov was the third player and the second captain in two years to leave the team because of differences with Stoichkov. On 17 March 2007, however, Petrov announced that he had had a private conversation with Stoichkov, in which they were able to work their differences out. As a result, Petrov would return to the team. On 10 April 2007, the Bulgarian Football Union announced they had accepted the resignation of Stoichkov from his post with the national team. That was as a result of the poor performance of the team at the ongoing Euro 2008 qualifying campaign, followed by widely spread criticism and debate over the qualities of the manager. The specific game, which led to increased pressure on Stoichkov, was the 0–0 home draw with Albania (despite the fact that the Bulgarians generally controlled the game and hit the post twice). He had a short disappointing stint as manager at Celta Vigo, for which he was sacked following the team's slump that took them to the lower reaches of the Spanish Second Division. On 8 October 2007, he was replaced by ex-Real Madrid manager Juan Ramón López Caro. On 12 March 2009, Stoichkov visited the Manchester City training ground after requesting a visit. On 29 June 2009, Stoichkov moved to Mamelodi Sundowns, where he replaced Henri Michel. On 16 March 2010, he quit Mamelodi Sundowns, with the former South Africa national team manager Trott Moloto named caretaker until a full-time replacement is found. In 2011, the Vietnam Football Federation invited Stoichkov to become the head manager of Vietnam national team. In the 2011–12 season, he worked as an advisor at Russian club Rostov. In January 2012, Stoichkov was appointed manager of Bulgarian side Litex Lovech, replacing Lyuboslav Penev, who left to become manager of the Bulgaria national team. In May 2013, Stoichkov was recognized as the A PFG manager of the season following a vote by the professional footballers in the Bulgarian league. In June 2013, he was named the manager of Bulgarian powerhouse – and former club – CSKA Sofia, but quit one month later after he lost faith in the troubled club. Scores and goals list Bulgaria's goal tally first. As of 8 July 2013. "Excellence Guirlande D'Honneur" and he entered in the FICTS "Hall of Fame". The only Player to win the European and Asian Edition of the Cup Winners Cup. He was named by Pelé as one of the 125 Greatest Living Footballers at a FIFA Awards ceremony in 2004. Eurosport made a voting in 2005 there Fans could decide who was the best Player in the 90s and Stoichkov won the Award. In 2011 he was named honorary consul of Bulgaria in Barcelona. In October 2017 he was removed from the position on the request of the Spanish government over his criticisms of this government (especially the deputy prime minister, Soraya Sáenz de Santamaría) in relation with the Catalan independence referendum, as well as the fact that he lives mainly in the United States. ^ "HRISTO STOICHKOV - FCBarcelona.cat". Fcbarcelona.com. Archived from the original on 3 January 2013. Retrieved 10 June 2013. ^ First XI: A burning hatred – ESPN FC. Soccernet.espn.go.com (13 October 2011). Retrieved on 10 June 2013. ^ "Шампионски гол в дъжда прави Ицо символ на победата" (in Bulgarian). temasport.com. 23 March 2016. ^ "Barcelona v Milan revisited: The night in 1994 the Dream died". The Guardian. 10 April 2015. ^ a b c "Hristo Stoichkov - Goals in International Matches". RSSSF. Retrieved 9 February 2016. ^ "CALCIO DAL MONDO" [Football from the World]. repubblica.it (in Italian). La Repubblica. Retrieved 7 April 2015. ^ Marino Bortoletti. "STOICHKOV, Hristo". treccani.it. Enciclopedia Treccani. Retrieved 3 January 2016. ^ "Hristo Stoichkov". fcbarcelona.com. Retrieved 7 April 2015. ^ "Manchester United v Barcelona: six of their best showdowns". The Telegraph. Retrieved 10 April 2015. ^ "POTENZA DI HRISTO SOLO UN ASSAGGIO" [Just a taste of Hristo's power]. repubblica.it (in Italian). La Repubblica. 29 July 1995. Retrieved 7 April 2015. ^ Leonardo Coen (16 May 1994). "L' ORA DELL' IMPLACABILE" [The hour of the unstoppable]. repubblica.it (in Italian). La Repubblica. Retrieved 7 April 2014. ^ Fulvio Bianchi (12 July 1994). "STOICHKOV, L' ADORABILE SPACCONE" [Stoichkov, the adorable boaster]. repubblica.it (in Italian). La Repubblica. Retrieved 7 April 2015. ^ Marco Jackson (27 March 2015). "Italy v Bulgaria: No longer the fantasista football of old". forzaitalianfootball.com. Retrieved 7 April 2015. ^ "L' ANNO DI HRISTO, GENIO DEI PIGRI" [The year of Hristo, Genius of the lazy]. repubblica.it (in Italian). La Repubblica. 20 December 1994. Retrieved 7 April 2015. ^ Jeff Wallenfeldt (2 May 2015). "Hristo Stoichkov". britannica.com. Encyclopædia Britannica. Retrieved 7 April 2015. ^ Goff, Steven (9 October 2007). "AU Player Settles With Club, MLS, Stoitchkov". The Washington Post. Retrieved 4 May 2010. ^ Goff, Steven (27 February 2007). "Player Hurt in United Scrimmage in '03 Seeks Damages". The Washington Post. ^ "Top 5 Legends FIFA 15" www.allaboutfifa.com. Retrieved 9 May 2015. ^ Petrov steps back from Bulgaria. UEFA (12 October 2006). ^ Petrov returns to Bulgaria fold. UEFA (19 March 2007). ^ Niemann, Christoph. (30 May 2013) Report: Celta Vigo fires coach Hristo Stoitchkov –. International Herald Tribune. Retrieved on 10 June 2013. ^ "Stoichkov named coach of South Africa's Sundowns". ESPN. London. 29 June 2009. ^ Hristo Stoitchkov not to renew contract. psl.co.za (17 March 2010). ^ "Stoichkov considering Vietnam offer". ESPN. 10 April 2015. ^ "Stoichkov parts company with Rostov". Goal. 10 April 2015. ^ "Стоичков е треньор №1 в "А" група, втори е Стоилов, а трети – Петев". topsport.bg. Sofia. 18 May 2013. ^ "Фенове искат да видят как Ицо взима акциите" (in Bulgarian). 7sport.net. 30 June 2013. Retrieved 19 October 2015. ^ "Hristo Stoichkov". National Football Teams. Retrieved 11 July 2018. ^ "Hristo Stoichkov". BDFutbol. Retrieved 11 July 2018. ^ "ストイチコフ". J.League (in Japanese). Retrieved 11 July 2018. ^ "Hristo Stoichkov". Major League Soccer. Retrieved 11 July 2018. ^ Roberto Di Maggio (25 June 2015). "Bulgaria - List of Topscorers". RSSSF. Retrieved 9 February 2016. ^ a b José Luis Pierrend (6 March 2012). ""Onze Mondial" Awards: Onze de Onze 1976-2011". RSSSF. Retrieved 14 September 2015. ^ a b José Luis Pierrend (28 January 2016). "FIFA Awards". RSSSF. Archived from the original on 12 January 2016. Retrieved 9 February 2016. ^ "WORLD CUP '94; Romario and Baggio Among First All-Star Cast". The New York Times. 16 July 1994. Retrieved 27 May 2015. ^ Emilio Pla Diaz (21 January 2016). "Spain - Footballer of the Year". RSSSF. Retrieved 9 February 2016. ^ "IFFHS: Former Results". IFFHS. Retrieved 27 August 2015. ^ "EURO '96". UEFA.com. Retrieved 9 February 2016. ^ "THE "GOLDEN BALL" HRISTO STOICHKOV TO "SPORT MOVIES & TV 2013" ON DECEMBER 4 IN MILANO - Ficts". Ficts. Retrieved 25 May 2017. ^ Stoyan Georgiev (21 January 2011). "Stoichkov, one of a kind for Bulgaria". UEFA.com. Retrieved 9 February 2016. ^ "Hristo Stoichkov and Katlego Mphela were awarded PSL Coach and Player of the month". 9 October 2009. Retrieved 15 January 2010.